We were floored to learn about how Seoul restored this lost river into a beautiful green urban corridor and now we're excited to bring you more info and images about the source point of the river and the amazing park created to celebrate it. The ChonGae Sunken Stone Garden is located in the central business district at the very beginning of the 7 mile corridor of the Cheonggyecheon Restoration Project. 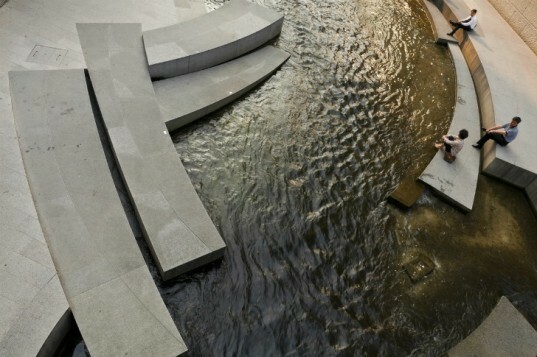 Designed by Mikyoung Kim Design, the public plaza is guided by the water levels from hour to hour and season to season allowing passersby to visually gauge the status of the river. Since its completion in 2005, the plaza has seen 10 million visitors and is an important space for special events as well as a critical addition to Seoul's public landscapes. 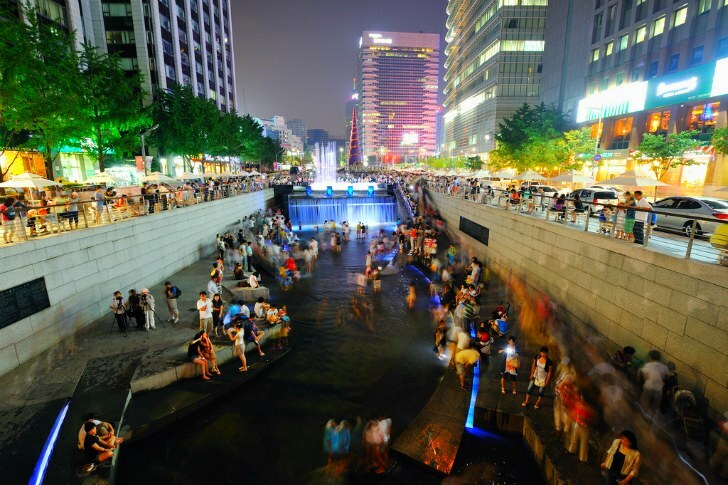 For 40 years, the Cheonggyecheon stream was covered with pavement and used as a road. Only those who saw the waterbody before it was filled in and covered over even knew it was a stream until the early 2000s when a project to unearth and restore it to its original glory came about. Two years and $281 million later, the stream became a beautiful urban park that improves the water quality and dramatically helps reduce urban heat island effect in the CBD. Symbolically, the river restoration reunifies the two sides of the city and is built from materials sourced from around the country. The ChonGae Sunken Stone Garden serves as the entry point and source of the water for the canal. Mikyoung Kim designed two superblocks within the corridor, including the stone garden. The firm’s design visually expresses the level of the water pouring out from the source and is a way for the residents of Seoul to see the state of the water. Water rises and falls over the unique sloped and stepped stones element, which can be read as water levels. Now serving as the veritable heart of Seoul’s CBD, ChonGae has become an important space for festivals, concerts, events, concerts, fashion shows and a great place to take a leisurely stroll! Having a large garden shed on large estates provides more than enough space for every gardening tool to be kept. For 40 years the Cheonggyecheon stream was covered with pavement and used as a road. Only those who came before it was filled in and covered over even knew it was a stream until the early 2000s when a project to unearth the stream and restore it to glory came about. 2 years and $281 million later, the stream become a beautiful urban park, the improves the water quality and dramatically helps reduce urban heat island effect in the CBD. Symbolically, the river restoration reunifies the two sides of the city and is built from materials sourced from around the country. The ChonGae Sunken Stone Garden serves as the entry point and source of the water for the canal. Mikyoung Kim designed two superblocks within the corridor, including the stone garden. The firm's design visually expresses the level of the water pouring out from the source and is a way for the residents of Seoul to see the state of the water. Water rises and falls over the unique sloped and stepped stones element, which can be read as water levels. Now serving as the veritable heart of the Seoul's CBD, ChonGae has become an important space for festivals, concerts, events, concerts, fashion shows as well as leisurely strolls and family outings. Overview of the canal restoration project. Rendering of the ChonGae Sunken Stone Garden. How water levels rise and fall over stone elements. Map of the canal through Seoul.